Pukaki Airport - Live to Fly! Sited right beside State Highway 8, this innovative Mackenzie Basin public airfield offers aviators an opportunity not to be missed. The Pukaki Airport development encourages aviation enthusiasts and businesses to own or lease land in this rapidly developing tourist area. 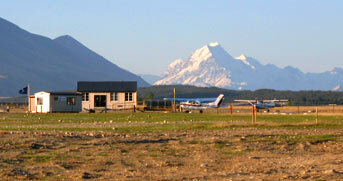 It is the culmination of an Aviation Strategy produced in the 1990’s by the Mackenzie District Council . The Council had a vision on how aviation could develop in the Mackenzie and central to this was creation of a public airfield at Pukaki. 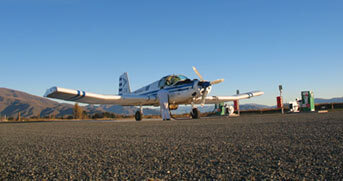 Pukaki Airport is located in the majestic Mackenzie Basin just 3 minutes drive from the service town of Twizel. Stunning scenery, full service infrastructure and sealed runways and taxiways combine to make this a unique aviation facility. Purchase a freehold section or obtain a lease, then build your own house and hangar! This 55 section subdivision includes sealed access roads, underground water, sewer and power with broadband capability. At the Pukaki Airport Development most hangars are “two storied” with mezzanine space available, providing flexibility and innovative design options to maximize the stunning Mackenzie Basin views. Private aviator’s accommodation area is 150 square metres, with a ground footprint of 75 square metres.